Hugh Farmer: This Enviromental Impact Assessment Report by the Civil Engineering Department in May 2000 provides some detail about salt production in Tai O on Lantau island. IDJ has provided the images showing the salt fields and workers of Tai O which do not come from the report. Jennifer Wong has kindly translated the script attached to the photographs. As the report says Salt-working is by far Hong Kong’s oldest industry. The earliest records indicate that…it probably began in the third century BC..most of what is known of the Hong Kong area in the thousand years before 955AD is connected with the salt industry. 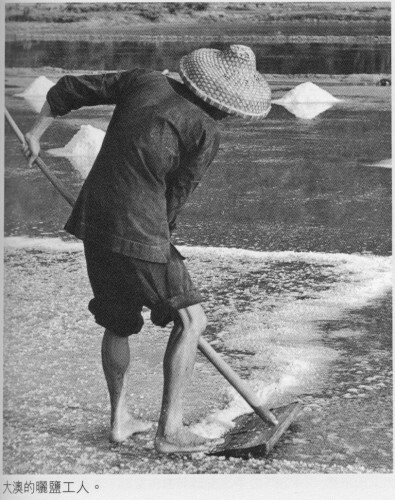 To put the industry in context, there is evidence of the Imperial Salt Monopoly and salt-fields in active use, more than a thousand years before the first mention of Hong Kong’s other two ancient industries of incense-wood production and pearl fishing. These salt production activities were also being carried out 1,300 years before the first settlement of any of today’s indigenous clans in the area. including, Tai O salt was…sold within HK mostly for industrial uses. I wonder what? Food preservation springs to mind but what else? 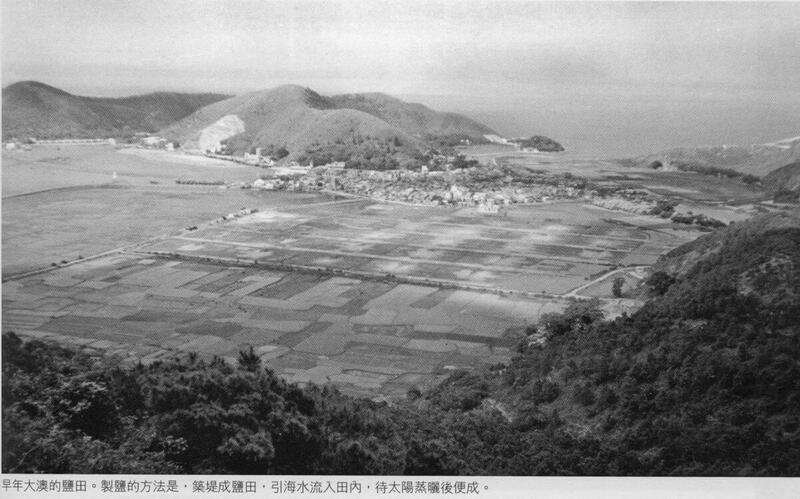 and, This trade [ ie salt-smuggling out of Tai O post 1936 and the Japanese blockade of the coast of China] died away somewhat after the Japanese occupation of Hong Kong, but was replaced with a boom trade in salt to Hong Kong and Macau, where foreign salt was no longer available. After the Second World War, the competition from foreign imported salt became overwhelming after about 1955, and the salt-field operators closed business between 1955 and the mid 1960s, although a few of the salines continued to be worked by the old salt-workers as squatters, until 1969-1970, when the construction of the Tai O Road destroyed the sluice systems. This article was first posted on 13th June 2014. Q&A 18 Koon Fu salt yards, place name Kwun Tong?